PORT SYDNEY — A frozen water line being thawed with a blow torch is being blamed for a fire here Friday afternoon at a cement factory. Huntsville/Lake of Bays firefighters were called shortly after 3 p.m. to the blaze on Stephenson Road 8 East in Port Sydney. Upon arrival, crews from Station 3 encountered smoke in the roof area of the two-storey structure. Two more pumpers, including an aerial ladder, were brought in from Huntsville Station 1 to assist. The occupants noticed smoke inside the building coming from the ceiling of the second storey. All occupants were able to safely exit the building. Crews were able to access the fire from the exterior of the building and contained the fire to the area of origin. The fire is believed to have started when a frozen water line was being thawed using a blow torch on the exterior of the building. The fire department does not recommend using a blow torch or other open flame device to thaw frozen pipes. Instead, apply heat to the section of pipe using an electric heating pad wrapped around the pipe, an electric hair dryer, a portable space heater (kept away from flammable materials), or by wrapping pipes with towels soaked in hot water. And if you cannot thaw the pipe, call a licensed plumber. Fire crews were called to a cement plant on Stephenson Rd. 8 E. in Port Sydney for a frozen pipe fire. An aerial ladder and another pumper truck were brought in from Huntsville. 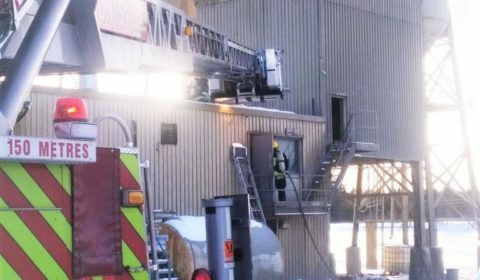 Firefighters arrived to find the fire on the second floor of the factory. « Muskoka gets $700,000 from province for transit initiatives	» How do you make 21 pond hockey rinks with all this snow?